Primalix® Number 2 for Diarrhea solution to your dog's "Number 2" problem. Is Your Dog Suffering With Diarrhea? A bout of dog diarrhea (or cat diarrhea) can be an unpleasant experience for both you and your pet. Diarrhea can be caused by bacteria, viruses or parasites, often from water or contaminated food. It can also be caused by food intolerance, a reaction to some medicines or even a change in food brand. What Kind Of Diarrhea Does My Dog Suffer From? There are two types of diarrhea. Acute diarrhea, despite its alarming name, is a temporary condition and not usually serious. Symptoms include soft or watery stools and abdominal discomfort. Acute diarrhea can be caused by bacterial infection, or could simply be your pet’s body healing itself or eliminating harmful toxins. The other type is Chronic diarrhea and is characterized by explosive, watery stools sometimes coated with blood or mucus. It can continue for days; your pet may even have normal stools in between the bouts of diarrhea. Chronic diarrhea is a long term condition that may cause weight loss or an unkempt appearance to your pet's fur or coat. Persistent chronic diarrhea may indicate an underlying condition such as irritable bowel syndrome (IBS), inflammatory bowel disease (IBD) or liver, thyroid or kidney disease. In cats (and to a lesser extent, dogs), diarrhea can be caused by pancreatitis (inflammation of the pancreas). Diarrhea accompanied by vomiting and sudden lethargy should be immediately checked out by a veterinarian. Preventing dehydration is your first step in treating diarrhea in dogs and cats. Dehydration can become very serious very quickly due to loss of essential electrolytes. Make sure your pet has access to plenty of fresh water. It is also important to tackle the cause of your pet's diarrhea. The good news is we can avoid harmful over-the-counter drugs and instead use some of nature's most potent anti-microbial and anti-parasitic herbal diarrhea treatments to blast unwanted bugs out of your pet's system. Is Primalix® 2 Safe For All Breeds of Dogs (or Cats)? Yes! Our Primalix® Number 2 for Dog Diarrhea is a safe and effective home remedy for all breeds of domestic dogs and cats. It contains a blend of natural medicines that disinfect your pet’s digestive system of the harmful bacteria that cause diarrhea including diarrhea with blood. It does it without prescription antibiotics that can further impede the digestive system. As well as microbe-demolishing herbal medicines, we use plant nutrients to relieve the physical discomfort a cat or dog with diarrhea can experience. We’ve included herbs that have anti-inflammatory action to soothe an irritated gastrointestinal tract, and cholagogue action to stimulate bile production. Nutritional uptake also recovers when digestive juices flow. Note: Primalix Number 2 doesn’t just cover up the symptoms. It empowers your pet’s natural healing defenses at the very source of the problem. How Is Primalix® Number 2 Superior To Other UTI Products On The Market? Primalix® Number 2 uses no harmful antibiotics, which can lead to gastrointestinal inefficiencies. All Primalix products give you 2 to 4 times more medicine than our competitors' 1 or 2 ounce bottles that cost about the same and may contain harmful alcohol. Why Should I Treat A Urinary Tract Infection Promptly? Diarrhea can be caused by bacteria, viruses or parasites, often from water or contaminated food. It can also be caused by food intolerance, a reaction to some medicines or even a change in food brand. Chronic diarrhea is characterized by explosive, watery stools sometimes coated with blood or mucus. This can continue for days; your pet may even have normal stools in between the bouts of diarrhea. Chronic diarrhea is a long term condition that may cause weight loss or an unkempt appearance to your pet's fur or coat. Echinacea is the herbalist’s Number 1 weapon against infection. In fact, before the introduction of antibiotics, Echinacea was the standard treatment for infections of all kinds. In Germany today, Echinace is approved by the government to treat, among other things, urinary tract infection. This thorny branched shrub has been used as a medicine for over 2500 years in the Ayurvedic and Chinese traditions. In Indian medicine dried Barberry root bark is used to treat diarrhea as well as reduce fever, soothe upset stomach, stimulate appetite and promote an overall sense of wellbeing. In addition to all this, berberine also acts as an analgesic to reduce gastrointestinal pain. It is a cholagogue, meaning it stimulates bile production to aid digestion and help destroy unwanted bacteria. Barberry also contains berbamine, another alkaloid. Both berbine and berbamine have astringent properties that help ‘shrink’ the mucus membrane in the intestine and reduce inflammation of the gastrointestinal tract. Finally, Barberry root bark boosts the immune system, always essential when recovering from a bout of cat or dog diarrhea. Another evergreen shrub, Oregon Grape Root produces berries whose color and dustiness resemble bunches of grapes; hence its name. Oregon Grape Root is related to Barberry and herbalists use it in clinical practice to treat intestinal parasites, gastritis and other digestive problems. Like Barberry, Oregon grape contains high levels of berberine3 and berbamine making this herb an excellent remedy for gastrointestinal problems and bacterial infections of the stomach and intestines. Also known as pot marigold, Calendula differs from the French marigold that is grown as an annual in gardens. Calendula is a medicinal plant that has been in use since the 12th century. It is well known for its near-miraculous skin healing properties, but also has some lesser known medicinal effects for fighting cat and dog diarrhea. Marshmallow derives its name from the Greek word althainein, meaning 'to heal'. Indeed this plant is one of nature's great soothing medicines. The toothed, velvety leaves of Marshmallow were used 2000 years ago in the Middle East to make poultices to alleviate inflammation, a practice still used in Arab folk medicine today. In tests, Marshmallow demonstrated significant anti-inflammatory activity. Both the roots and leaves contain mucilage, a gum-like substance. When mucilage comes into contact with water it forms a gel. This gel relieves inflammation and reduces irritation of the gastrointestinal tract by soothing mucus membranes present in the stomach and intestine. Our extraction solvent (menstruum) consists of our own proprietary blend of organic vegetable glycerin (zero calories), apple cider vinegar, and crystal clear water which we ionize and purify through filters measuring one one-hundredth of a micron. We do not extract with alcohol, which is harmful to dogs and cats, nor with heat which "denatures" the very herbal constituents that do the healing. Our herbs are organically cultivated (USDA Certified Organic or Wildharvested) to maintain purity. We then place them into our full spectrum extraction process one precious gallon at a time, at the peak of their potency cycle, agitating frequently for no less than a fortnight. Ours is a time-honored tradition of tincturing that assures the constituent ratios in our extracts are identical to the synergistic nutrient ratios in the plants used. For cat or dog urinary tract infection, administer by mouth on an empty stomach, or add to food. What If My Dog Suffers From Diarrhea? Primalix® Number 2 for Diarrhea in Dogs is a safe and effective home remedy for all breeds of domestic dogs. 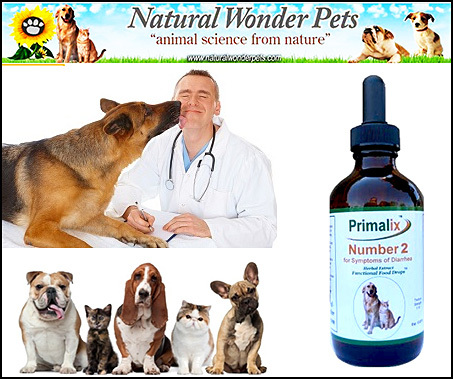 Primalix® Number 2 contains our proprietary blend of natural USDA Certified Organic herbs that disinfect your pet’s digestive system of the harmful bacteria that cause diarrhea including diarrhea with blood. It does this without prescription antibiotics that can further impede the digestive system. As well as microbe-demolishing herbal medicines, we use plant nutrients to relieve the physical discomfort a cat or dog with diarrhea can experience. We’ve included herbs that have anti-inflammatory action to soothe an irritated gastrointestinal tract, and action to stimulate bile production. Nutritional uptake also recovers when digestive juices flow. Primalix Number 1 Herbal Extract Functional Food Drops that you have our Ironclad, Bottom-of-the-Bottle. Your dog deserves the comforting, soothing restoration that Natural Wonder Pets have been giving to dogs across America.